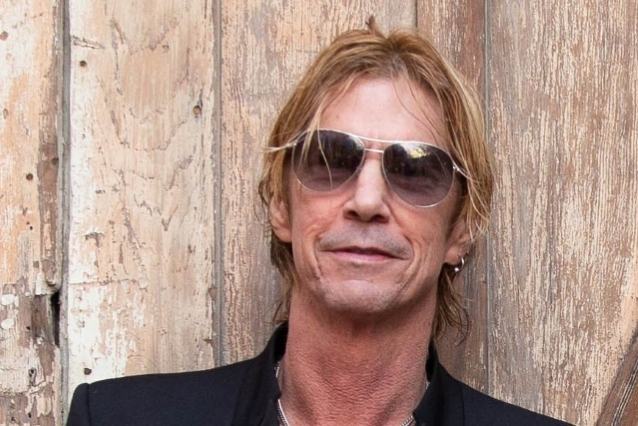 GUNS N' ROSES bassist Duff McKagan was recently asked by Forbes to name his greatest weakness and to talk about how he has overcome that weakness to get where he is today. Duff responded: "Probably my greatest weakness, I don't like to call it that anymore. That's part of the way I've gotten over it. At 16, I started having panic disorder. My first one happened out of nowhere. I was in the shower at my mom's house. The floor just sunk down three feet and I thought there was an esrthquake or something. It was actually a panic attack. I self-medicated those things in my 20s with a ton of alcohol. And they kind of ruled my life. Of course, the more alcohol you drink, the more sugars in your system, the more panic attacks you're gonna have. Through Ukidokan and really measuring these things out and kind of tackling them and taking them face on and figuring out a way through them, it was a weakness I've turned into something that's a teachable moment. I can understand a lot more about mental illness and panic disorder that has sides of depression to it that I never experienced until a couple of years ago. I had a depression attack, which was the worst thing you can ever have. But I've dealt with this thing through Ukidokan and I'm very fortunate to have a very positive force in my life that I can work on these things. So my weakness has kind of turned into a strength. I can help others." McKagan left GUNS N' ROSES in 1997 but rejoined the group in 2016 for its recently completed "Not In This Lifetime" tour, which is believed to be the second-highest grossing tour of all time.